For the first #TheGopherProject spotlight, how could I not pick someone who I consider the queen of stringers? I do not think there is anything Robin cannot do. Dye a head? Check. String a phenomenal traditional women’s pocket? Check. 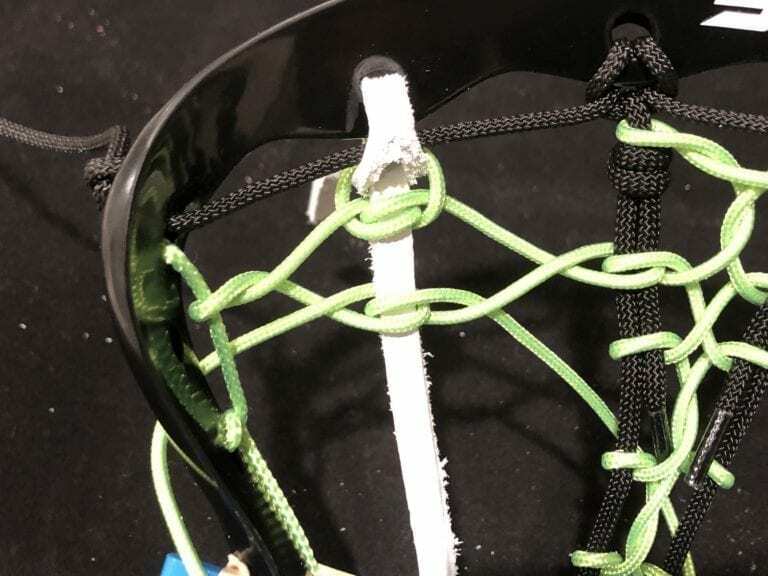 String mesh in any stick? Check. Since my traditional tutorial was geared towards the men, it’s only fitting that we go through the process of how to string Robin’s most favorite pocket. The Single Twist Pita Pocket. As we walk through this tutorial, Robin is going to jump in and give insight or tips along the way! BONUS: Check out last week’s Monthly Mailbag on #TheGopherProject here! Knots: Same as the six diamond tutorial, all strings will start with a double over hand knot and end with a single knot. Step 1. We’ll begin with the sidewalls. Start with the first hole and skip every other hole working your way to the bottom, tie off and you’re done. (Robin Tip!) Be sure to keep two sidewall holes open on each side so you have a place to attach your shooters. Step 2. 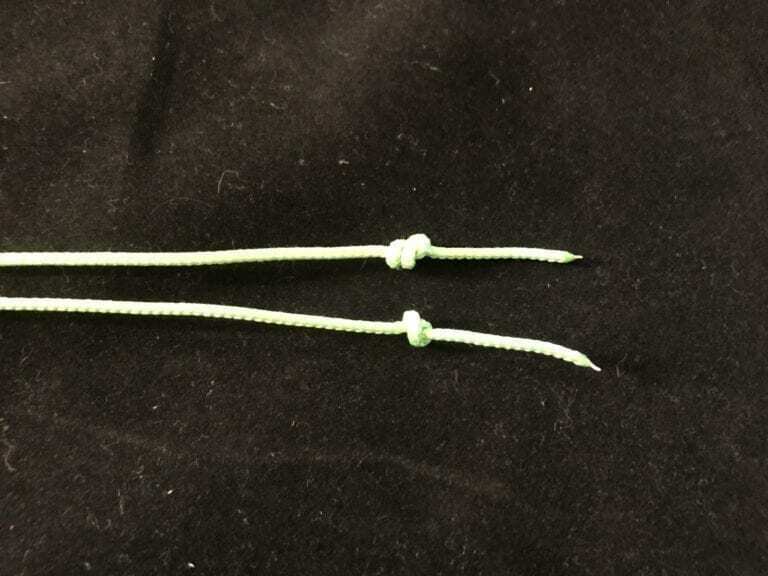 Take two of the sections of top string/paracord and tie a double overhand loop knot. Make sure you leave slack so they cannot work themselves loose. 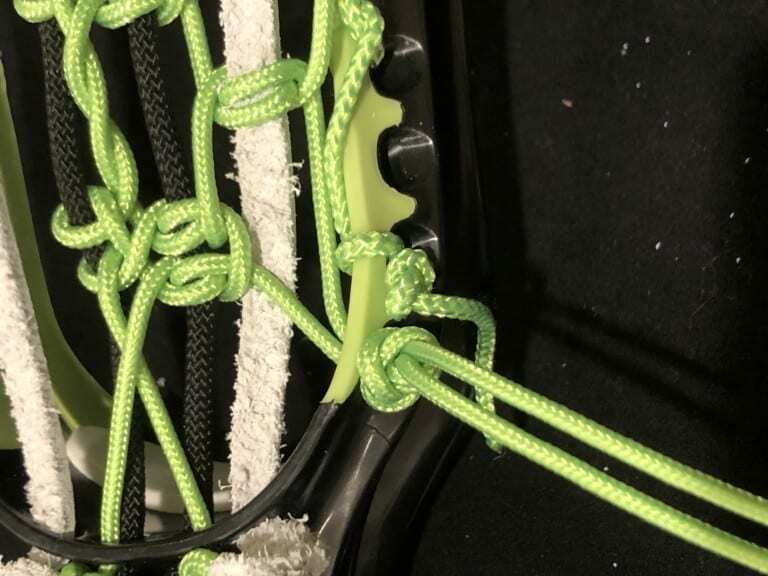 Take the final piece and tie a double overhand knot and string through the first sidewall hole. Then loop through the first middle scoop hole and run the top string through the loop of one of the previous two you knotted. Loop through the same scoop hole and pull tight (see pic). Continue to the next scoop hole and repeat. Tie off on the other side. Step 3. Attach the two leathers to the outer two scoop holes. You can use both slits in the leather but it’s common in women’s heads to only use the top slit and clip the other. Do not cut until the end of the string up. For this tutorial we are using Robin’s version for the Single Twist Pita Pocket. Step 4. Install the Traditree. When it comes to women’s pockets, I prefer the Traditree since it allows me to control the tension and pocket depth. I do not attach like a normal Traditree I actually attach to the top of the head since it allows the pocket to be shallower. Place the leathers and runners and tie off at the bottom. (Robin Tip) I string this freehand but I still own a Traditree and encourage everyone who strings to have one in their tool kit! 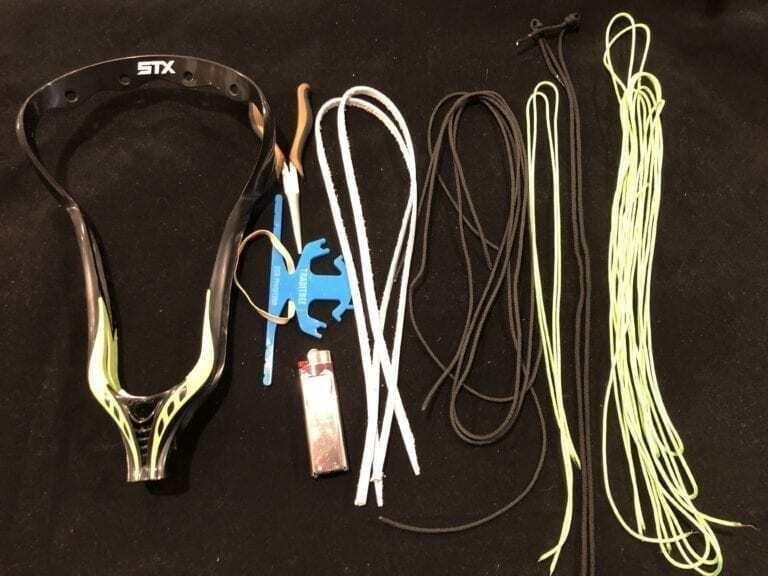 (Kevin Tip) I’m not Robin so I am using one….plus it’s the LTD one I got before she could at Laxcon last year…..score! Step 5. From here on out, we are going to be looking at the back of the head. We’re starting in the center with the pita twists. 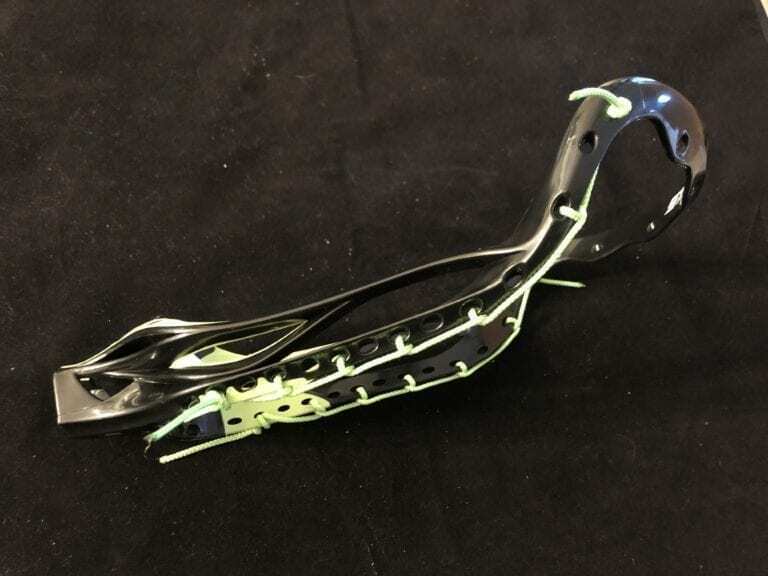 Take the piece of crosslace and run it from the middle of the head to the sides. 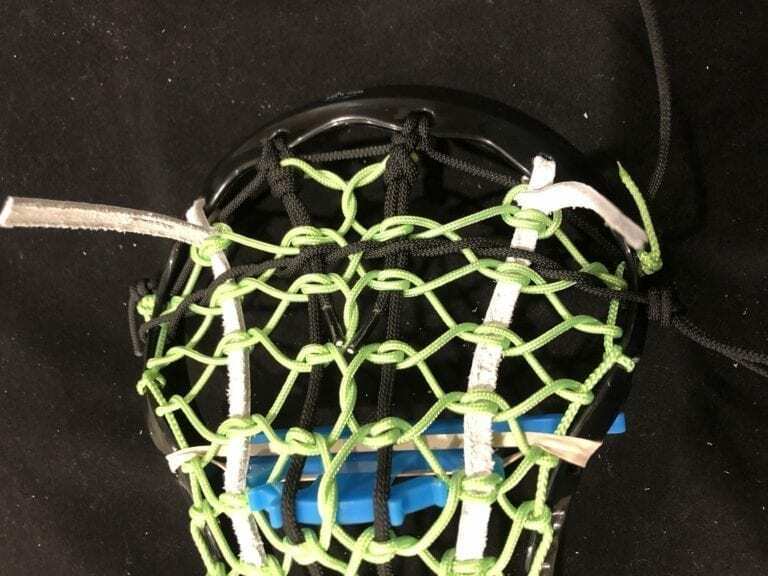 Once the crosslace is perfectly centered in the middle of the head. 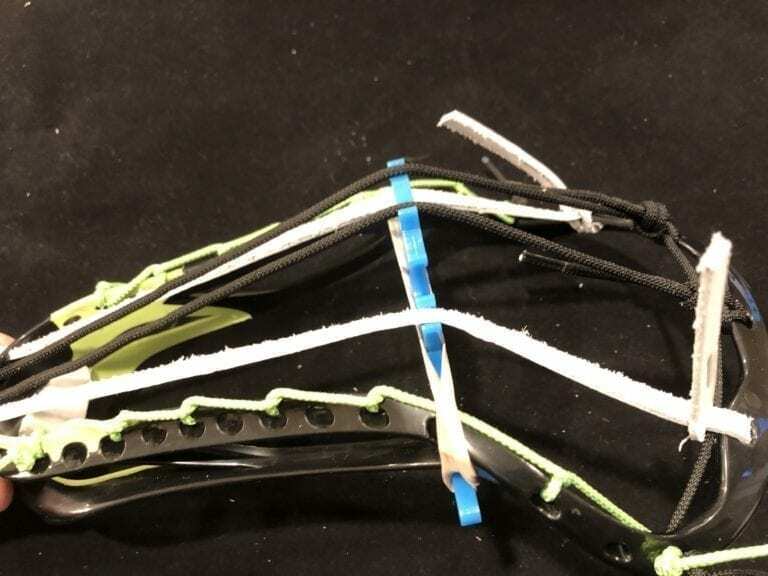 Take the two ends and bring them behind the crosslace. Make sure that each side is equal and give the string one twist. Bring the string around the back of each runner (the top string or paracord) and loop around. Again, make sure each side is even and the twist is centered on the head. Now take the crosslace in your left hand and bring it to the right side. Right side to the left and do another interlock. Now for the next THREE twists, we are going to do the same step. 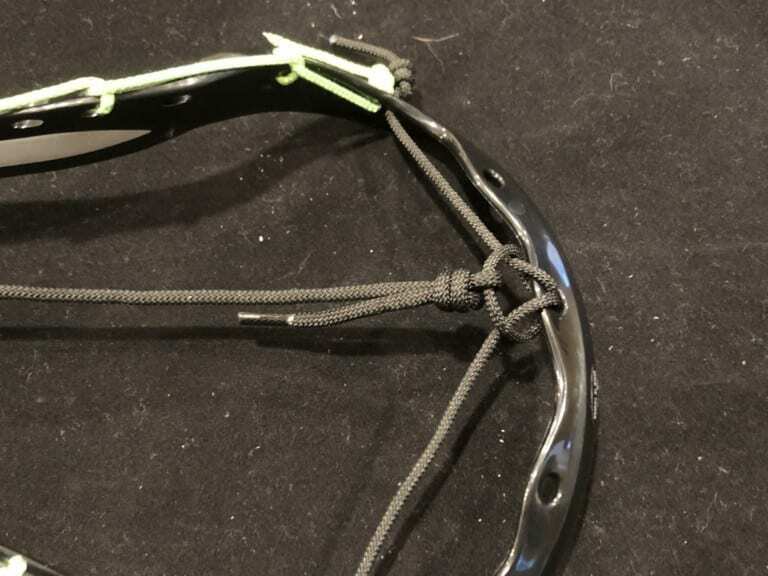 Take the crosslace and position it in the middle of the runners, you’re going to twist the crosslace once and make sure the twist lays perfectly in the middle of the runner and then interlock each side. The following THREE twists, you are going to do the same step as above but do TWO twists instead of one. (Robing Tip) I include three double twists at the throat to keep the center of the pita tight and to encourage high pocket placement. The single twists at the top flex around the ball and absorb impact better than the stiffer double twist. I want all crosslace near the throat to be tighter than that at the high pocket area. We are going to end the last two interlocks there will be no twists, just bring the crosslace to the side. Take the crosslace at the bottom and run it to the opposite throat hole (where the runners are already tied). Now, let’s double check the middle section. Are all the interlocks even on each side? Is the Pita center track in a perfect line? If not, go back and adjust the tension. Now relax the hardest part is done! Step 6. The sides! Take one section of the crosslace and center in the middle of the leather. (Robing Tip) I use an interlock knot at the top of the leather to ensure that the crosslace is as tight as possible. 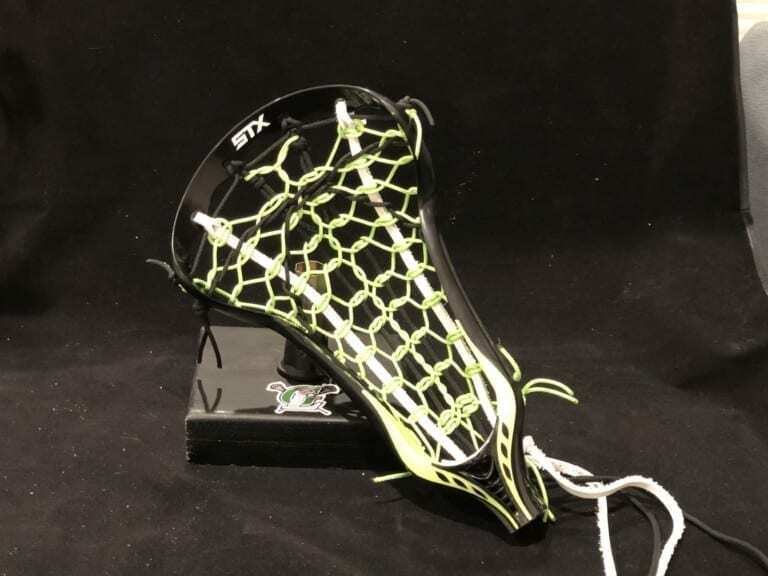 The crosslace nearest the scoop should be a bit tighter than that which makes up the body of the pocket to decrease the chance of the ball catching lip on a hard follow through. From here we are going to be working both sides of the leather (instead of doing one row and then down the other) to make sure we’ve got proper tension. 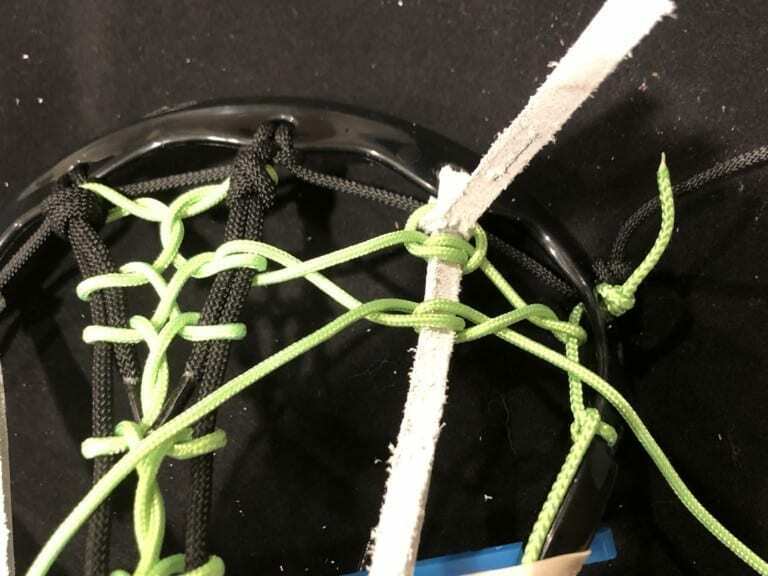 Take the crosslace and interlock to the runner side and the other side to the sidewall. Meet back in the leather and create and interlock with both sides. It’s important to set the interlock properly. Make sure each leather interlock lays in the middle of the runner interlocks. 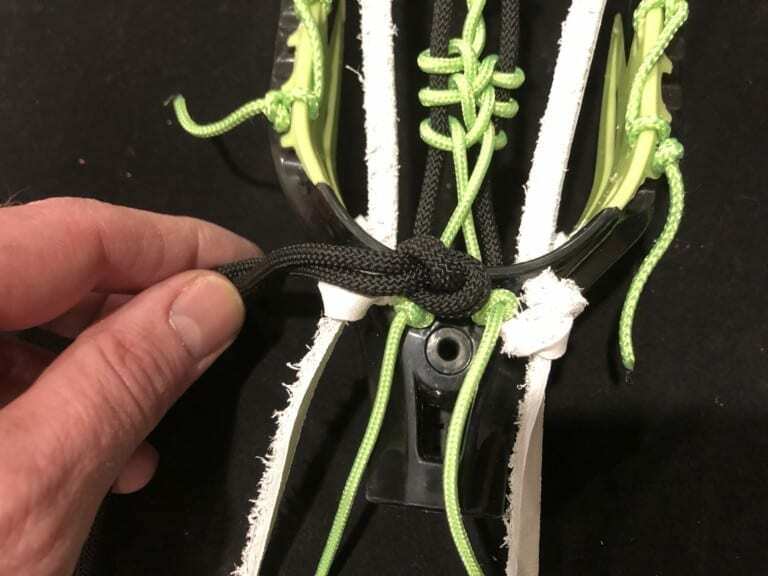 Work your way down and after the last interlock (you’ll have eight interlocks on the leather sides), run both pieces of crosslace to the sidewall hole and tie off. 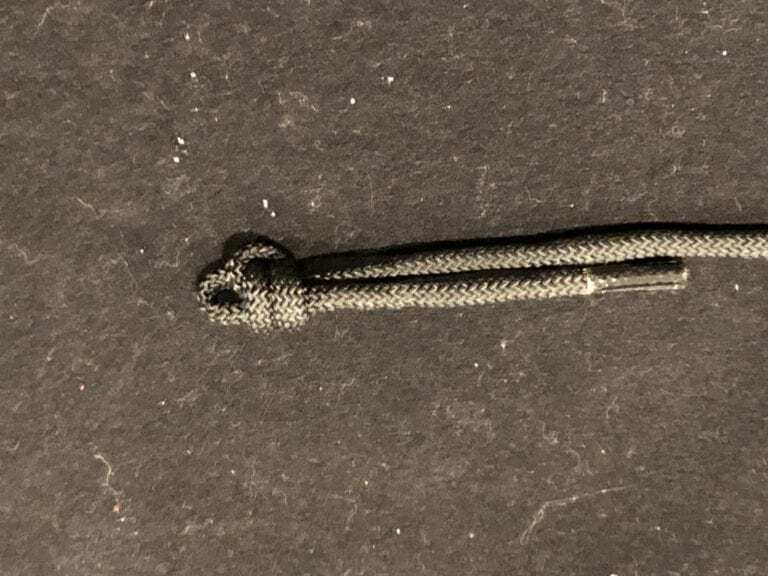 (Robin Tip) Personally I string the medial sections of crosslace first and then the lateral sections after while working in pocket shape with my hand. (Kevin Tip) Follow Robin’s tip if you are stringing without a Tradi! Step 7. Shooters! 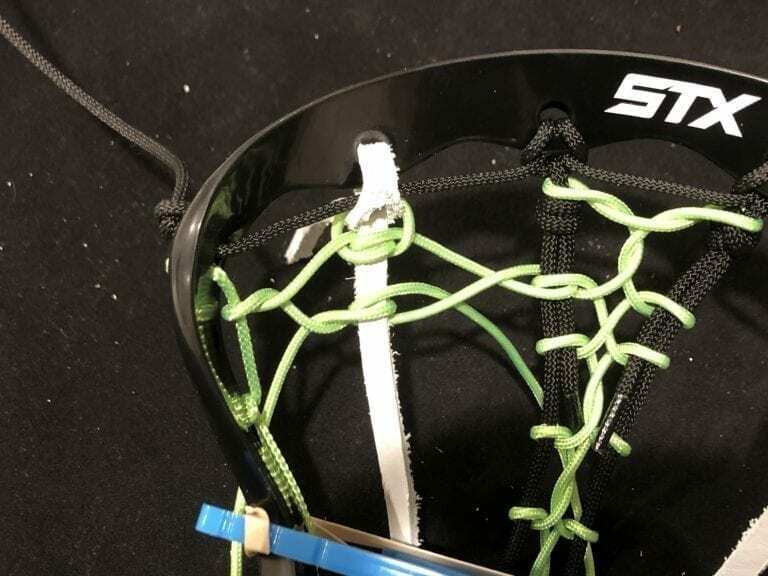 Take one shooter and either on the second or third sidewall head (it needs to go through the head and not wrap around) and push one end through and even each piece. A good point of reference is that the shooter should sit between 1st and 2nd interlock. Simple weave the shooter across the head and tie off at the opposite end. The second shooter is going to form a “U” and sit on the interlock below the 1st. (Robin Tip) I find that stacking the shooters so that there is minimal space between them provides a good hold-to-release ratio. The U shooter helps with accuracy (I recommend using it over a straight! 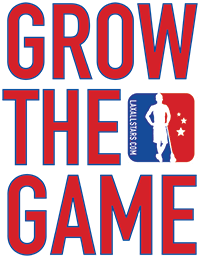 It was taken out of the men’s game for a reason…), and combined with the straight shooter provides a deep enough ramp to hold the ball vertically but still release predictably. Once you located where the shooter is going to sit, go down three or four interlocks and put the shooter through the sidewall. We’ll weave it up to the section and back down the other side. If you’ve never done this before, don’t worry, it’ll take a minute or two to get the hang of it. Step 8. Review. Make sure your interlocks and tension is good. Are the shooters right? Double check everything before you cut and burn any excess strings. Clip the extra section of leather at the top and remove the Traditree. Take a ball and make sure it’s at legal depth, if not, adjust, put the head on a shaft and hit the wall. Voila! Your Single Twist Pita Pocket is complete!